This "Tracking Light for Model Rockets" project appeared in the September 1969 issue of Model Rocketry and was the first kit sold by MITS. While serving at the Air Force Weapons Laboratory at Kirtland Air Force Base, Ed Roberts and Forrest M. Mims III decided to use their electronics background to produce small kits for model rocket hobbyists. 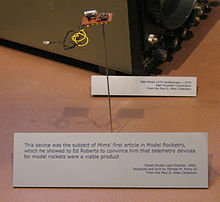 In 1969, Roberts and Mims, along with Stan Cagle and Robert Zaller, founded Micro Instrumentation and Telemetry Systems (MITS) in Roberts' garage in Albuquerque, New Mexico, and started selling radio transmitters and instruments for model rockets. The model rocket kits were a modest success and MITS wanted to try a kit that would appeal to more hobbyists. The November 1970 issue of Popular Electronics featured the Opticom, a kit from MITS that would send voice over an LED light beam. As Mims and Cagle were losing interest in the kit business, Roberts bought his partners out, then began developing a calculator kit. Electronic Arrays had just announced a set of six large scale integrated (LSI) circuit chips that would make a four-function calculator. The MITS 816 calculator kit used the chip set and was featured on the November 1971 cover of Popular Electronics. This calculator kit sold for $175 ($275 assembled). Forrest Mims wrote the assembly manual for this kit and many others over the next several years. He often accepted a copy of the kit as payment. The calculator was successful and was followed by several improved models. The MITS 1440 calculator was featured in the July 1973 issues of Radio-Electronics. It had a 14-digit display, memory, and square root function. The kit sold for $200 and the assembled version was $250. MITS later developed a programmer unit that would connect to the 816 or 1440 calculator and allow programs of up to 256 steps. In addition to calculators, MITS made a line of test equipment kits. These included an IC tester, a waveform generator, a digital voltmeter, and several other instruments. To keep up with the demand, MITS moved into a larger building at 6328 Linn NE in Albuquerque in 1973. They installed a wave soldering machine and an assembly line at the new location. In 1972, Texas Instruments developed its own calculator chip and started selling complete calculators at less than half the price of other commercial models. MITS and many other companies were devastated by this, and Roberts struggled to reduce his quarter-million-dollar debt. January 1975 Popular Electronics with the Altair 8800 computer. Published on November 29, 1974. In January 1972, Popular Electronics merged with another Ziff-Davis magazine, Electronics World. The change in editorial staff upset many of their authors, and they started writing for a competing magazine, Radio-Electronics. In 1972 and 1973, some of the best construction projects appeared in Radio-Electronics. One of the editors, Les Solomon, knew MITS was working on an Intel 8080 based computer project and thought Roberts could provide the project for the always popular January issue. The TV Typewriter and the Mark-8 computer projects were just a detailed set of plans and a set of bare printed circuit boards. The hobbyist faced the daunting task of acquiring all of the integrated circuits and other components. The editors of Popular Electronics wanted a complete kit in a professional-looking enclosure. Ed Roberts and his head engineer, Bill Yates, finished the first prototype in October 1974 and shipped it to Popular Electronics in New York via the Railway Express Agency. However, it never arrived due to a strike by the shipping company. Solomon already had a number of pictures of the machine and the article was based on them. Roberts got to work on building a replacement. The computer on the magazine cover is an empty box with just switches and LEDs on the front panel. 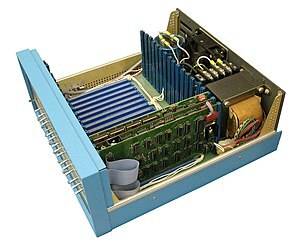 The finished Altair computer had a completely different circuit board layout than the prototype shown in the magazine. The January 1975 issues appeared on newsstands a week before Christmas of 1974 and the kit was officially (if not yet practically) available for sale. The typical MITS product had a generic name like the "Model 1440 Calculator" or the "Model 1600 Digital Voltmeter". Ed Roberts was busy finishing the design and left the naming of the computer to the editors of Popular Electronics. One explanation of the Altair name, which editor Les Solomon later told the audience at the first Altair Computer Convention (March 1976), is that the name was inspired by Les's 12-year-old daughter, Lauren. "She said why don't you call it Altair – that's where the Enterprise is going tonight." The Star Trek episode is probably Amok Time, as this is the only one from The Original Series which takes the Enterprise crew to Altair (Six). Another explanation is that the Altair was originally going to be named the PE-8 (Popular Electronics 8-bit), but Les Solomon thought this name to be rather dull, so Les, Alexander Burawa (associate editor), and John McVeigh (technical editor) decided that: "It's a stellar event, so let's name it after a star." McVeigh suggested "Altair", the twelfth brightest star in the sky. Ed Roberts had designed and manufactured programmable calculators and was familiar with the microprocessors available in 1974. He thought the Intel 4004 and Intel 8008 were not powerful enough (in fact several microcomputers based on Intel chips were already on the market: the Canadian company Microsystems International's CPS-1 built in 1972 used a MIL MF7114 chip modeled on the 4004, the Micral marketed in January 1973 by the French company R2E and the MCM/70 marketed in 1974 by the Canadian company Micro Computer Machines); the National Semiconductor IMP-8 and IMP-16 required external hardware; the Motorola 6800 was still in development. So he chose the 8-bit Intel 8080. At that time, Intel's main business was selling memory chips by the thousands to computer companies. They had no experience in selling small quantities of microprocessors. When the 8080 was introduced in April 1974, Intel set the single unit price at $360 (About $1,700 in 2014 dollars). "That figure had a nice ring to it," recalled Intel's Dave House in 1984. "Besides, it was a computer, and they usually cost thousands of dollars, so we felt it was a reasonable price." Ed Roberts had experience in buying OEM quantities of calculator chips and he was able to negotiate a $75 price (about $350 in 2014 dollars) for the 8080 microprocessor chips. A May 1975 advertisement for the Altair 8800 Computer appeared in Popular Electronics, Radio-Electronics, and other magazines. For a decade, colleges had required science and engineering majors to take a course in computer programming, typically using the FORTRAN or BASIC languages. This meant there was a sizable customer base who knew about computers. In 1970, electronic calculators were not seen outside of a laboratory, but by 1974 they were a common household item. Calculators and video games like Pong introduced computer power to the general public. Electronics hobbyists were moving on to digital projects such as digital voltmeters and frequency counters. The Altair had enough power to be actually useful, and was designed as an expandable system that opened it up to all sorts of applications. Ed Roberts optimistically told his banker that he could sell 800 computers, while in reality they needed to sell 200 over the next year just to break even. When readers got the January issue of Popular Electronics, MITS was flooded with inquiries and orders. They had to hire extra people just to answer the phones. In February MITS received 1,000 orders for the Altair 8800. The quoted delivery time was 60 days but it was months before they could meet that. Roberts focused on delivering the computer; all of the options would wait until they could keep pace with the orders. 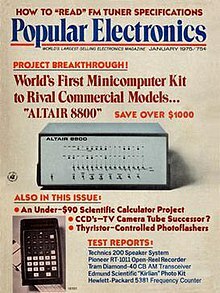 MITS claimed to have delivered 2,500 Altair 8800s by the end of May. The number was over 5,000 by August 1975. MITS had under 20 employees in January but had grown to 90 by October 1975. The Altair 8800 computer was a break-even sale for MITS. They needed to sell additional memory boards, I/O boards and other options to make a profit. The system came with a "1024 word" (1024 byte) memory board populated with 256 bytes. The BASIC language was announced in July 1975 and it required one or two 4096 word memory boards and an interface board. MITS Price List, Popular Electronics, August 1975. MITS had no competition in the US for the first half of 1975. Their 4K memory board used dynamic RAM and it had several design problems. The delay in shipping optional boards and the problems with the 4K memory board created an opportunity for outside suppliers. An enterprising Altair owner, Robert Marsh, designed a 4K static memory that was plug-in compatible with the Altair 8800 and sold for $255. His company was Processor Technology, one of the most successful Altair compatible board suppliers. Their advertisement in the July 1975 issue of Popular Electronics promised interface and PROM boards in addition to the 4K memory board. They would later develop a popular video display board that would plug directly into the Altair. In 1977, Pertec Computer Corporation purchased MITS and began to market the computer, without changes (except for branding), as the PCC 8800 in 1978. In the first design of the Altair, the parts needed to make a complete machine would not fit on a single motherboard, and the machine consisted of four boards stacked on top of each other with stand-offs. Another problem facing Roberts was that the parts needed to make a truly useful computer weren't available, or wouldn't be designed in time for the January launch date. So during the construction of the second model, he decided to build most of the machine on removable cards, reducing the motherboard to nothing more than an interconnect between the cards, a backplane. The basic machine consisted of five cards, including the CPU on one and memory on another. He then looked for a cheap source of connectors, and came across a supply of 100-pin edge connectors. The S-100 bus was eventually acknowledged by the professional computer community and adopted as the IEEE-696 computer bus standard. The Altair bus consists of the pins of the Intel 8080 run out onto the backplane. No particular level of thought went into the design, which led to such disasters as shorting from various power lines of differing voltages being located next to each other. Another oddity was that the system included two unidirectional 8-bit data buses, when the normal practice was for a single bidirectional bus (this oddity did, however, allow a later expansion of the S-100 standard to 16 bits bidirectional by using both 8-bit buses in parallel). A deal on power supplies led to the use of +8V and +18V, which had to be locally regulated on the cards to TTL (+5V) or RS-232 (+12V) standard voltage levels. The Altair shipped in a two-piece case. The backplane and power supply were mounted on a base plate, along with the front and rear of the box. The "lid" was shaped like a C, forming the top, left and right sides of the box. The front panel, which was inspired by the Data General Nova minicomputer, included a large number of toggle switches to feed binary data directly into the memory of the machine, and a number of red LEDs to read those values back out. Ed Roberts received a letter from Traf-O-Data asking if he would be interested in buying its BASIC programming language for the machine. He called the company and reached a private home, where no one had heard of anything like BASIC. In fact the letter had been sent by Bill Gates and Paul Allen from the Boston area, and they had no BASIC yet to offer. When they called Roberts to follow up on the letter he expressed his interest, and the two started work on their BASIC interpreter using a self-made simulator for the 8080 on a PDP-10 minicomputer. They figured they had 30 days before someone else beat them to the punch, and once they had a version working on the simulator, Allen flew to Albuquerque to deliver the program, Altair BASIC (aka MITS 4K BASIC), on a paper tape. The first time it was run, it displayed "READY" then Allen typed "PRINT 2+2" and it immediately printed the correct answer: "4". The game Lunar Lander was entered in and this worked as well. Gates soon joined Allen and formed Microsoft, then spelled "Micro-Soft". Announced in late 1975, it started shipping in August 1977. SIMH emulates Altair 8800 with both 8080 and Z80. ^ Rojas, Raúl (2001). Encyclopedia of computers and computer history. Chicago [u.a. ]: Fitzroy Dearborn. ISBN 1-57958-235-4. ^ Young, Jeffrey S. (1998). "Chapter 6: 'Mechanics: Kits & Microcomputers'". Forbes Greatest Technology Stories: Inspiring Tales of the Entrepreneurs. New York: John Wiley & Sons. ISBN 0-471-24374-4. ^ Garland, Harry (March 1977). "Design Innovations in Personal Computers". Computer. IEEE Computer Society. 10 (3): 24. doi:10.1109/c-m.1977.217669. 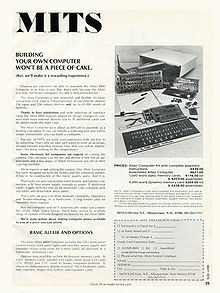 There is little question that the current enthusiasm in personal computing was catalyzed by the introduction of the MITS Altair computer kit in January 1975. ^ Dorf, Richard C., ed. The engineering handbook. CRC Press, 2004. ^ Ceruzzi, Paul E. (2003). A History of Modern Computing. Cambridge, MA: MIT Press. p. 226. ISBN 0-262-53203-4. "This announcement [Altair 8800] ranks with IBM's announcement of the System/360 a decade earlier as one of the most significant in the history of computing." ^ Freiberger, Paul; Swaine, Michael (2000). Fire in the Valley: The Making of the Personal Computer. New York: McGraw-Hill. ISBN 0-07-135892-7. ^ ‹See Tfd›US patent 3800129, ‹See Tfd›Richard H. Umstattd, "MOS Desk Calculator", issued 1974-03-26 The Electronic Arrays, Inc. calculator chip set that was used in the MITS 816 calculator. ^ Ed Roberts (November 1971). "Electronic desk calculator you can build". Popular Electronics. Vol. 35 no. 5. Ziff Davis. pp. 27–32. ^ Kellahin, James R. (July 1973). "The 1440: A calculator with memory, square root and other new features". Radio-Electronics. Gernsback Publication. 44 (7): 55–57. The cover story is for the MITS 1700 waveform generator. An ad for the MITS 1200, a $99 battery operated handheld calculator, is on page 15. ^ Roberts, H. Edward (1974). Forrest M. Mims (ed.). Electronic Calculators. Howard W. Sams. pp. 128–143. ISBN 0-672-21039-8. ^ a b "Popular Electronics; January 1975 issue" (PDF). ^ a b Ogdin, Jerry (June 1975). "Computer Bits". Popular Electronics. Vol. 7 no. 6. New York: Ziff-Davis. p. 69. "The break through in low-cost microprocessors occurred just before Christmas 1974, when the January issue of Popular Electronics reached readers … "
^ a b c Mims, Forrest M. (November 1984). "The Altair story; early days at MITS". Creative Computing. Vol. 10 no. 11. Creative Computing. p. 17. Archived from the original on 8 April 2007. Retrieved 2007-03-17. ^ H. Edward Roberts; William Yates (January 1975). "Altair 8800 minicomputer". Popular Electronics. Vol. 7 no. 1. Ziff Davis. pp. 33–38. ^ Milford, Annette (April 1976). "Computer Power of the Future - The Hobbyists". Computer Notes. Altair Users Group, MITS Inc. 1 (11): 7. Archived from the original on March 23, 2012. Retrieved 2007-12-01. "Les Solomon entertained a curious audience with anecdotes about how it all began for MITS, The name for MITS' computer, for example, was inspired by his 12-year-old daughter. She said why don't you call it Altair -- that's where the Enterprise is going tonight." ^ Green, Wayne (February 1976). "Believe Me - I'm No Expert!". 73 Magazine. No. 184. Peterborough, NH: 73, Inc. p. 89. Wayne Green visited MITS in August 1975 and interviewed Ed Roberts. Article has several paragraphs on the design of the Altair 8800. ^ Intel Corporation (1984). Glynnis Thompson Kaye (ed.). A Revolution in Progress - A History to Date of Intel. Intel Corporation. p. 14. Order number:231295. ^ Freiberger, Paul; Swaine, Michael (2000). Fire in the Valley: The Making of the Personal Computer. New York, NY: McGraw-Hill. p. 42. ISBN 0-07-135892-7. "Roberts was sure he could get the chip price much cheaper, and he did. Intel knocked the price down to $75." ^ Mims, Forrest (January 1985). "The Tenth Anniversary of the Altair 8800". Computers & Electronics. Ziff Davis. 23 (1): 58–62, 81–82. "But because the 8080 sold for $360 in single quantities, few people could afford it. Ed Roberts bought the chips in large quantities and was able to get a substantial discount…"
^ Ceruzzi, Paul E. (2003). A History of Modern Computing. Cambridge, MA: MIT Press. pp. 222–224. ISBN 0-262-53203-4. ^ Michalopoulos, Demetrios A. (October 1976). "New Products". Computer. IEEE. 9 (10): 59–64. doi:10.1109/C-M.1976.218414. "Intel Corporation has announced that an interactive display console and highspeed line printer are now available for the Intellec MDS microcomputer development system. … The display console costs $2240 and the printer $3200 in quantities of 1 to 9. Delivery is in 30 days. Price of the basic Intellec MDS with 16K bytes of RAM memory, including interfaces and resident software for operating the peripherals, is $3950." ^ Bunnell, David (August 1975). "Across the Editor's Desk". Computer Notes. Altair Users Group, MITS Inc. 1 (3): 2. Archived from the original on March 23, 2012. Retrieved 2007-12-26. Intel letter to its sales force. "We wish to clarify any misconception that may exist in your minds regarding the MITS ALTAIR system. This product is designed around the Intel Standard Data Sheet 8080 family." ^ Veit, Stan (1993). Stan Veit's History of the Personal Computer. Alexander, North Carolina: WorldComm Press. p. 283. ISBN 1-56664-030-X. "Ed Roberts was able to get around this problem by obtaining a supply of cosmetic reject chips for about 1/3 the retail price." ^ Brillinger, P. C.; D. D. Cowan (November 1970). "A complete package for introducing computer science". SIGCSE Bulletin. ACM. 2 (3): 118–126. doi:10.1145/873641.873659. Describes the introductory computer science courses at the University of Waterloo. ^ Ceruzzi, Paul E. (2003). A History of Modern Computing. Cambridge, MA: MIT Press. pp. 201–206. ISBN 0-262-53203-4. ^ MITS (June 1975). "MITS advertisement". Digital Design. CMP Information. 4 (6). Archived from the original on 10 December 2007. Retrieved 2008-01-01. "There was a subsequent article in February's Popular Electronics and the MITS people knew the Altair was here to stay. During that month alone, over 1,000 mainframes were sold. Datamation, March 1975." "By the end of May, MITS had shipped over 2,500 Altair 8800's"
^ Green, Wayne (October 1975). "From the Publisher .. Are they real?". BYTE. Green Publishing. 1 (2): 61, 81, 87. In August 1975 Wayne Green visited several personal computer manufacturers. A photo caption in his trip report says; "Meanwhile, at MITS, over 5,000 Altair 8800's have been shipped. Here is a view of part of the production line." ^ a b Roberts, H. Edward (October 1975). "Letter from the President". Computer Notes. Altair Users Group, MITS Inc. 1 (5): 3. Archived from the original on March 23, 2012. Retrieved 2008-07-12. "We had less than 20 employees when we introduced the Altair and now we have grown to 90 as a result of our Altair customers." Roberts also discussed the problems with the 4K dynamic RAM boards. Customers got a $50 refund. ^ MITS (August 1975). "Worlds Most Inexpensive BASIC language system". Popular Electronics. Vol. 8 no. 2. Ziff Davis. p. 1. ^ Moore, Fred (July 1976). "Hardware". Homebrew Computer Club Newsletter. 1 (5): 2, 5. Retrieved 2007-12-30. ^ Littman, Jonathan (1987). Once Upon a Time in ComputerLand: The Amazing, Billion-Dollar Tale of Bill Millard. Los Angeles: Price Stern Sloan. p. 18. ISBN 0-89586-502-5. "Later that day, December 16 , United Parcel Service picked up the first shipment of 50 IMS computer kits for delivery to customers." ^ "MITS - ALTAIR COMPANY IS SOLD TO PERTEC (MAY 1977)". OldComputers.Com. Retrieved October 14, 2015. ^ Greelish, David (1996). "Ed Roberts Interview with Historically Brewed magazine". Historically Brewed. Historical Computer Society (9). Retrieved 2007-11-22. Ed Roberts said: "We had a Nova 2 by Data General in the office that we sold time share on …The front panel on an Altair essentially models every switch that was on the Nova 2. We had that machine to look at. The switches are pretty much standard of any front panel machine. It would have taken forever if we would have had to re-decide where every switch had to go. " ^ Gates, Bill. "NATIONAL MUSEUM OF AMERICAN HISTORY Bill Gates interview". Solomon, Les (September 1984). "Solomon's Memory". In Ditlea, Steve (ed.). Digital Deli: The Comprehensive, User-Lovable Menu of Computer Lore, Culture, Lifestyles and Fancy. Workman Publishing. ISBN 0-89480-591-6. Freiberger, Paul; Swaine, Michael (2000). Fire in the Valley: The Making of the Personal Computer. New York, NY: McGraw-Hill. ISBN 0-07-135892-7. Mims, Forrest M (1986). Siliconnections: Coming of Age in the Electronic Era. New York: McGraw-Hill. ISBN 978-0-07-042411-1. Veit, Stanley (1993). Stan Veit's history of the personal computer. Asheville, N.C: WorldComm. ISBN 978-1-56664-030-5. Young, Jeffrey S. (1998). Forbes Greatest Technology Stories: Inspiring Tales of the Entrepreneurs. New York: John Wiley & Sons. ISBN 0-471-24374-4. Chapter 6 "Mechanics: Kits & Microcomputers"
Greelish, David (1996). "Ed Roberts Interview with Historically Brewed magazine". Historically Brewed. Historical Computer Society (9). Retrieved 2007-11-22. Green, Wayne (October 1975). "From the Publisher .. Are they real?". BYTE. Green Publishing. 1 (2): 61, 81, 87. Mims, Forrest M. (November 1984). "The Altair story; early days at MITS". Creative Computing. Vol. 10 no. 11. Creative Computing. p. 17. Archived from the original on 8 April 2007. Retrieved 2007-03-17. Mims, Forrest (January 1985). "The Tenth Anniversary of the Altair 8800". Computers & Electronics. Ziff Davis. 23 (1): 58–62, 81–82. Roberts, H. Edward; William Yates (January 1975). "Altair 8800 minicomputer". Popular Electronics. Vol. 7 no. 1. New York, NY: Ziff Davis. pp. 33–38. Retrieved 2008-04-26. Wikimedia Commons has media related to Altair 8800. "Altair 8800". New Mexico Museum of Natural History and Science. Archived from the original on March 23, 2012. Retrieved 2007-12-18.